The exquisitely crafted Weekender embodies classic sophistication for the weekend warrior and intrepid traveler. It's made from supple yet durable superior top grain calf leather that will age beautifully, get softer and develop a richer patina over time. The smart design incorporates a big gusset and a wide opening zipper - this makes the main compartment open up wide and offers easy access to accommodate and reach your belongigngs. The spacious, fabric lined interior is secured with zip fastening and houses a main compartment with an internal zipped pocket for extra security and two additional pockets for your cell phone/chargers and other small items. The duffel has full leather rolled carrying handles and a comfortable leather accented shoulder strap with a soft leather comfort pad. Whether you're going on a long haul trip or a quick jaunt to the gym, count on this weekender to take you there in style. The dimensions meet most carry-on baggage guidelines.. DURABLE - Forget PU & Faux materials, 100% Guaranteed top grain calf leather - for a superior and lasting product. QUICK ACCESS - The weekender features a broad gusset and longer zippers - for a wide opening mouth. EASY TO CARRY - Leather accented fully adjustable and removable shoulder strap & twin rolled leather handles - for multiple carrying options. 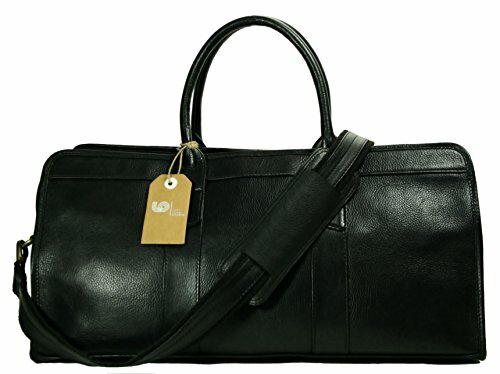 PREMIUM CONSTRUCTION - Genuine top grain calf leather, YKK professional grade metal zippers (no cheap plastic), solid metal hardware, reinforced seams, rivets at stress points, quality UV resistent threads, high thread count lining fabric and quality stitching combined to make a perfect bag.